Prom is an opportunity to express your personal style. 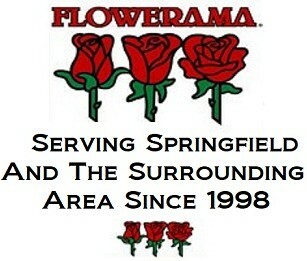 Flowerama is here to help with unique prom flower designs. Call today to customize your prom accessories. Prom is a special time for the guys as wellas the girls. 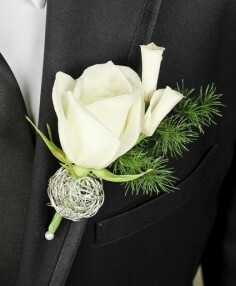 Let him show off his personal style with a unique and custom prom flower of his own. 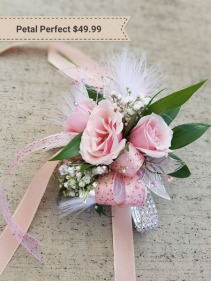 This wrist corsage is our daintiest selection with 3 spray rose blooms, ribbon and accent flowers on an elastic bracelet. 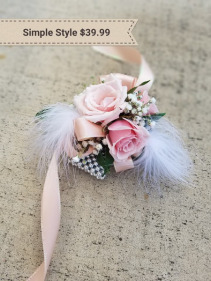 This is great as a budget freindly selection and for a "Father Daughter Dance". We can also size the bracelet down on request. Each design is custom made based on your preferences and needs. Give us a call to discuss and changes you need or place details in the special intructions. Petal perfect is the premium selection for wrist corsages. 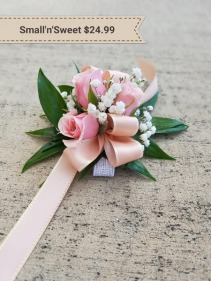 With 5 spray rose blooms, baby's breath or other accent flower, 2 ribbon selections and more customizable accents all arranged on a designer keepsake bracelet. Each design is custom made based on your preferences and needs. Give us a call to discuss and changes you need or place details in the special intructions.